At the heart of a Shimansky jewellery creation, is a combination of a South African treasure, the pursuit of perfection, passion, innovation, vision and understanding of the client and of their special moment. In the centre of the Shimansky world, is you, the client. The reward we get from our clients sharing their special moment and using our jewellery as a memory of that moment, is what drives us to deliver the very best that we can. From an idea evolving into a design, to a finished creation of a beautiful jewellery item, each and every step in the creation process is completed in-house, to ensure the very best work is achieved, every step of the way. Our start-to-finish approach is the unique philosophy that drives us to deliver the highest standard of excellence. Nestled between the ocean and the mountain, Cape Town is known for its natural beauty. From the serenity of its wine farms, to the splendour of its sandy beaches, the Cape Town spirit is embodied in all who inhabit this magnificent city. South Africa, with its rich heritage and cultural diversity, is home to some of the most beautiful diamonds in the world, and is a treasure trove of gold, platinum, and precious stones. It all comes together at the Waterfront, home to the Shimansky workshops, showroom, and Diamond Museum. Located at the edge of the Waterfront harbour with the incredible Table Mountain in the background, there is no shortage of inspiration. Being surrounded by some of the world’s best wines, of course, makes creative inspiration just that little bit more plentiful. The Shimansky My Girl diamond cut was the first internationally patented diamond cut to originate from South Africa. This truly South African design is one that can only be achieved by using the very rarest of diamonds, and up to half the rough stone is sacrificed to create this cut. In a class of its own, this signature diamond cut has captured the heart of a nation, and intrigued those from around the globe. 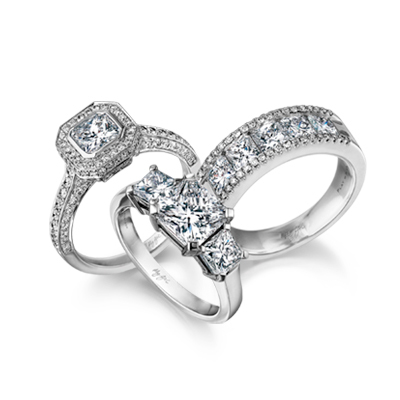 The Shimansky Millennium diamond ring is the most sought-after engagement ring in South Africa. Adored by South Africans for its elegance, and by international visitors for its unique design, it has become an icon in the South African jewellery world. The never-ending pursuit of perfection lead to the creation of the Brilliant 10 diamond, known as the most brilliant cut diamond in the world. There are more than ten Shimansky jewellery design patents and more than five international Shimansky diamond-cut patents. For our customers, this means that all of our signature collections are only available from Shimansky, in South Africa, and cannot be found anywhere else in the world, making our creations truly exclusive. The desire to continue to create unique and beautiful designs has Shimansky constantly investing in technology and development in the world of design. In such a magnificent city, our inspiration comes from the art and culture of the people of South Africa, the beauty of nature, the incredible architecture we are surrounded by, and, perhaps most importantly, the beauty of the human spirit. With, among others, the most advanced 3D CAD design software, 3D printers and laser-welding technology, we have the ability to design and visualise a jewellery creation long before it goes to manufacturing. Once a design is ready to be brought to life, the perfect diamond is selected by a Shimansky expert, and is then cut to precision, thanks to years of experience, and state-of-the-art equipment. A super fine natural diamond powder is used to polish Shimansky diamonds – along with a little bit of virgin olive oil on a diamond wheel, each stone is polished to reveal its maximum beauty. Three carats of diamond powder is used to polish a one carat diamond. Shimansky is known for its master craftsmanship and design excellence, however, we believe that the true key to success and longevity, is our pursuit for perfection. Innovation is a necessity, and as a result, we continuously try to improve at everything we do, and to discover new and better ways of revealing a diamond’s true potential. Achieving perfection is a journey of discovery, attention to detail and craftsman. A journey in which only the best will do. With diamonds being formed over 3 billion years ago, it is our responsibility to take our time to take a diamond to its end, the step in which its true potential is revealed. Our customer, our friend, is what makes us do what we do. Our customer is what drives us to go beyond our best. The greatest reward and our passion is to become part of your special moment and journey, knowing that you have selected a Shimansky creation for your journey. It is our honour and privilege to craft a jewellery creation that uniquely expresses your love, that says something about your personality and that will capture and preserve your memory. Our passion is an emotional one, and beyond the cut and design, there is a story behind each and every piece of Shimansky jewellery. It is only when a client’s unique story and life journey merges with a mesmerising Shimansky creation, that true perfection is realised.